Even if your bucket still has its handle, the 4-in-1 Bucket Tool will fit over the standard five-gallon bucket handle to give you a wider grip. It’ll open the larger buckets with plastic lids or metal tab lids, and it’ll pry up a regular one-gallon paint can lid or one of those pesky pour spouts. 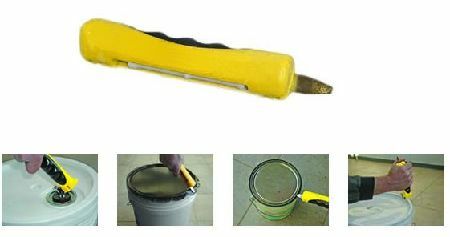 The 4-in-1 Bucket Tool sells for about $7. Anybody ever use one of these? When we are changing air scrubber media, we will open 700 five gallon buckets in a day. Are these better for prying lids of than my channel locks?